So reads a sign that my daughter made when she was visiting me in the office one day. She held it up to the glass wall of our conference room to get my attention while I was leading a meeting. 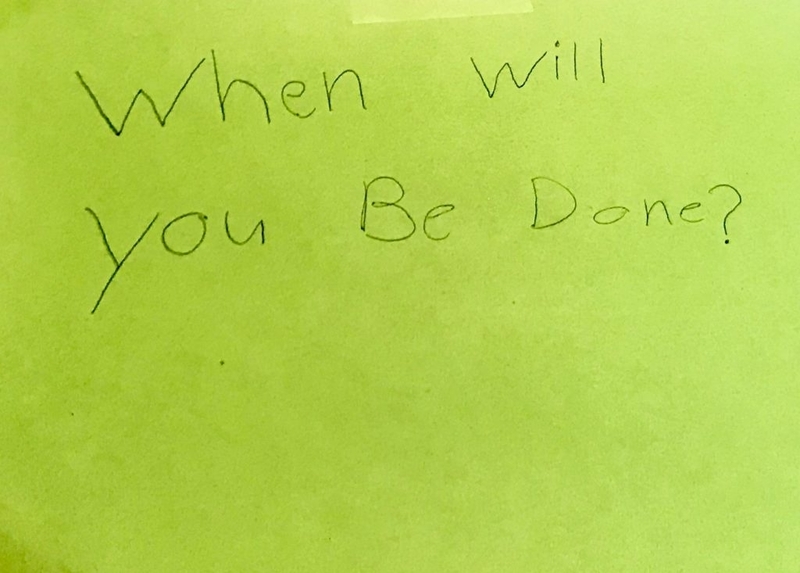 I kept it and hung it in my office, as a reminder of two important facts: that my children were waiting for me to come home from work and be their mom, and that Connecticut’s children were waiting for us to achieve our mission of a great education for each and every one of them. As I write this last message to you as ConnCAN CEO, I’m reflecting on the work we’ve done together. Thank you for the incredible opportunity to work alongside you in the fight to make sure that all Connecticut children get the great public education they need and deserve. Together, we brought light to Connecticut’s staggering opportunity gaps and fought for change. We achieved big wins for kids, and we are making progress this legislative session toward even more inclusive, fairly-funded and excellent schools. But this work is far from done. Our efforts have never been easy, but the unwavering support of advocates like you made it possible. Together, we’ve shown courage, heart, optimism and a relentless commitment to putting Connecticut’s kids and families first, always. Working alongside you in my home state that I love has been an honor. I am certain that ConnCAN will continue to lead the way. With the support of the 50CAN network, our grassroots advocacy will grow stronger with each new campaign–and we know there is a passionate groundswell of leaders across the country joining the fight for great schools in their states. So, when will we be done? Not until the work is done, too. For now, I will take a breath and spend time with my children, and I look forward to continuing this fight with you as a ConnCAN supporter. Together, we’ll build a brighter future for our kids and our state.